TURKISH Airlines has exposed its new seating class, which it says combines business class convenience with economy value. 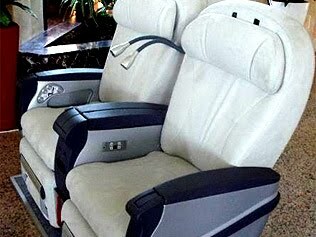 Comfort class, the airline’s fourth seating class, will be presented on its Boeing 777 aircraft on flights to Asia and the Americas. The seats will be 49 centimetres wide with a pitch of 116 centimetres and will comprise 10.6 inch in-arm video screens. Passengers will be able to utilize personal USB devices or iPods and there will also be a leg rest available. "The intention is to combine the convenience of business-class with the reasonable purchasing rates of economy-class," a Turkish Airlines spokesperson said. "The most significant privilege that comfort class provides the passengers is that the seats have been designed in a way allowing the knee and sitting space to be kept at its maximum range." The product will be primarily offered on the airline’s Sao Paulo, Beijing, Tokyo, Bangkok and Shanghai routes. It will moreover be offered on New York, Chicago and Washington DC flights.